This was amazing. My guide was beyond informative. Great guy!!! The driver was helpful and respectful as well!! I will def recommend to anyone !!! 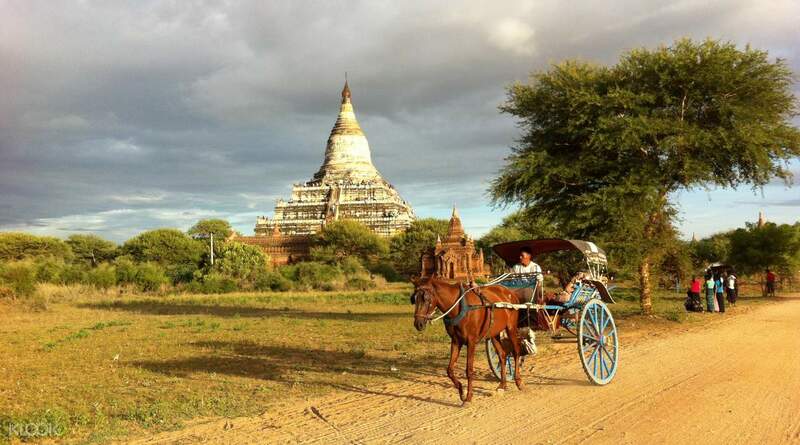 Explore the gorgeous temples of Bagan in the same way the royals do: by horse-drawn cart! 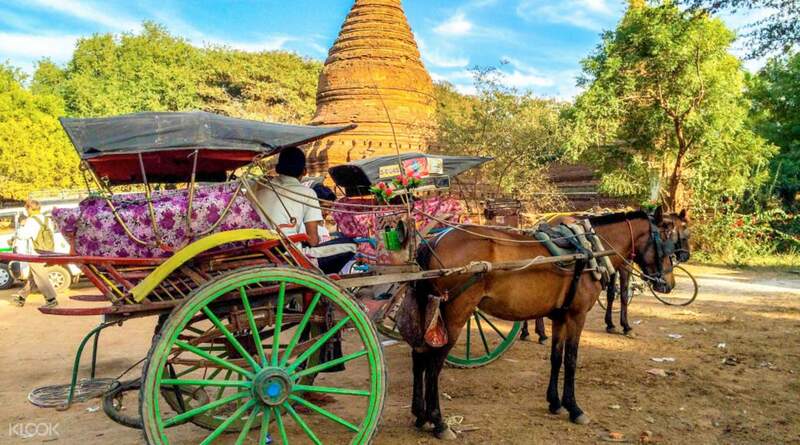 Ride in style through a tour of some of Bagan's most noteworthy cultural stops, giving you a truly authentic experience. You'll start your excursion with a pick up right from your hotel. The cart ride will first take you to explore the Ananda Temple, which dates all the way back to 1090 AD and is a true masterpiece. You'll marvel at the massive Buddha images that stand proudly within it. If you're particularly fond of seeing Bagan's architecture up close, the next stop at That Byin Nyu Temple will give you a good look at how the Mon period architecture transitioned to the present. At the end of your magical carriage ride, you'll view a spectacular sunset at the rustic watch tower. It's a true panoramic view of Bagan that you will take home with you, as your cart tour drops you off back to your hotel. This was amazing. My guide was beyond informative. Great guy!!! The driver was helpful and respectful as well!! I will def recommend to anyone !!! This was amazing. My guide was beyond informative. Great guy!!! The driver was helpful and respectful as well!! I will def recommend to anyone !!! i got Mr Oo as a tour guide, he is very good person with excellent information about Bagan. He explained everything about Bagan very well. Thank you! i got Mr Oo as a tour guide, he is very good person with excellent information about Bagan. He explained everything about Bagan very well. Thank you! The guide has made the tour a very pleasant one! He can speak good English, keep asking us if there is question for him. A very good photographer also! The guide has made the tour a very pleasant one! He can speak good English, keep asking us if there is question for him. A very good photographer also! The tour guide was very knowledgeable and attentive. He took many photos for us each place and all photos taken by him were so good. Service excellent. Thanks Klook !!! The tour guide was very knowledgeable and attentive. He took many photos for us each place and all photos taken by him were so good. Service excellent. Thanks Klook !!! Our guide was terrific but the horse cart experience was cramped and it was difficult to converse since we were literally facing away from our guide. Mr. Oo, our guide though was terrific though he had a lot of information and was very responsive to our needs instead of just following the generic guide. He listened to what we were looking for and made the tour a unique experience. Our guide was terrific but the horse cart experience was cramped and it was difficult to converse since we were literally facing away from our guide. Mr. Oo, our guide though was terrific though he had a lot of information and was very responsive to our needs instead of just following the generic guide. He listened to what we were looking for and made the tour a unique experience. Fantastic horse cart tour! Super friendly guide with good knowledge and explanation on the ancient temple. Fantastic horse cart tour! Super friendly guide with good knowledge and explanation on the ancient temple. We enjoyed the tour. The driver is very friendly. We enjoyed the tour. The driver is very friendly. Tour guide was funny and have sense of humor. It is a very unique way to explore the city! Tour guide was funny and have sense of humor. It is a very unique way to explore the city!